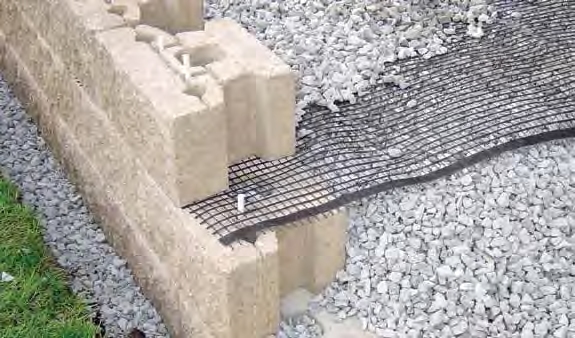 Geo-grid is used to reinforce and stabilize the backfill area behind a wall. 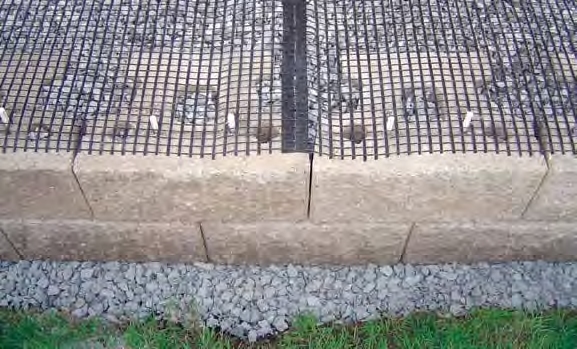 Additionally through its connection with the Keystone fiberglass pins, the Geo-grid acts as a tieback to maintain the position of the wall face. 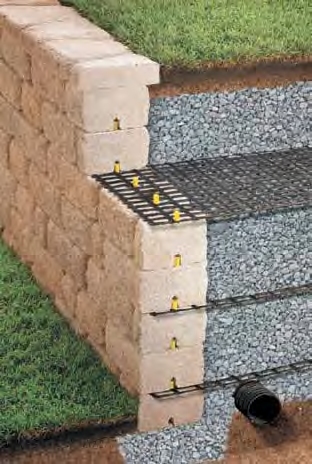 Retaining walls 3 feet or higher may require Geo-grid. Bauer distributes the Stratagrid line of polyester Geo-grids through our Authorized Dealers. Stratagrid Geo-grids reinforce soil with their high molecular weight and high tenacity polyester yarns. The yarns are precision knitted, dimensionally stable and coated with a black UV stabilized material which provides both mechanical and chemical durability. Stratagrid is produced in multiple strengths in order to provide the most efficient design possible for your retaining wall project. 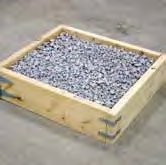 The gravel is only contained by the walls of the box. 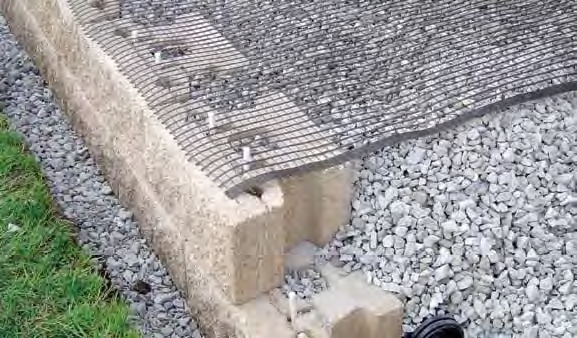 Without reinforcement the gravel collapses when the walls are removed. 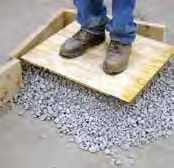 When the walls are removed the layers of Geo-grid maintain the shape of the gravel block. Geo-grid is added between layers of gravel. Bauer carries common roll sizes which are 6’ W x 150’ L, or 6’ W x 300’ L depending on the product. We also have smaller rolls ideal for residential applications which are 4’ W x 50’ L. Additionally we carry the Stratatex woven geotextile fabric and the Sleeve-it product. Contact your local Authorized Dealer for more information and availability of these products. Note: In critical situations Geo-grid may be required in walls under 3 ft. Review your project with a qualified engineer to determine requirements. Geo-grid roll direction is from the wall toward the embankment, perpendicular to the wall face. Excavate reinforced soil area. 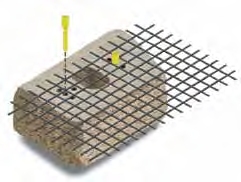 Remove existing soils in the reinforced soil area to the maximum embedment length of the Geo-grid design. 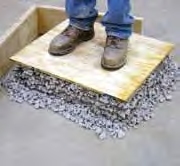 Provide a generally level soil condition behind the wall units for the placement of each Geo-grid layer. Cut Geo-grid. Cut sections from Geo-grid roll to the specified length (embedment depth). Geo-grid roll direction is from the wall toward the embankment (check manufacturer’s criteria). In most cases correct orientation is to roll the Geo-grid perpendicular to the wall face. Install Geo-grid. 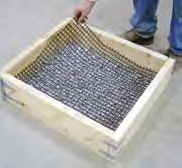 Hook Geo-grid over the fiberglass pins to ensure a positive mechanical connection between the unit and Geo-grid. Secure Geo-grid. Pull the pinned Geo-grid taut to eliminate loose folds. Stake or secure back edge of Geo-grid before and during backfill and compaction. Remove stakes, if desired, once backfill is placed. Place additional sections of Geo-grid, abutting each other, for continuous coverage at each layer. Install next course of Keystone units. Check for level with each new course. Place compacted backfill over Geogrid in 6 to 8 inch lifts. Provide a minimum of six inches reinforced fill coverage prior to driving equipment over the Geo-grid with wheeled or tracked equipment. Avoid driving or turning equipment directly on Geo-grid to avoid excessive damage. Place Geo-grid 3/4 to 1 inch back from wall face so Geo-grid will be hidden once the wall is completed.